Challenging prevalent conceptualizations of modernity―which treat it either as a Western ideology imposed by colonialism or as a universal narrative of progress and innovation―this study instead offers close readings of the simultaneous performances and contestations of modernity staged in works by authors such as Rifa’a al-Tahtawi, Ahmad Faris al-Shidyaq, Tayeb Salih, Hanan al-Shaykh, Hamdi Abu Golayyel, and Ahmad Alaidy. In dialogue with affect theory, deconstruction, and psychoanalysis, the book reveals these trials to be a violent and ongoing confrontation with and within modernity. 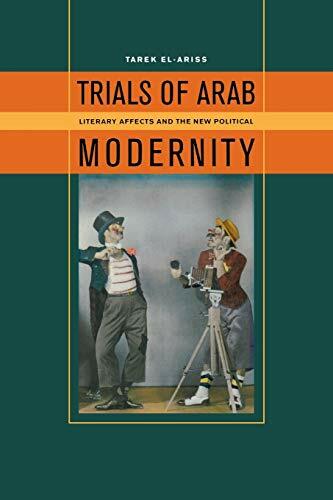 In pointed and witty prose, El-Ariss bridges the gap between Nahda (the so-called Arab project of Enlightenment) and postcolonial and postmodern fiction. About the Author&colon; Tarek El-Ariss is Associate Professor of Middle Eastern Studies at Dartmouth College. His books include Trials of Arab Modernity: Literary Affects and the New Political (2013), Leaks, Hacks, and Scandal: Arab Culture in the Digital Age (2018), and The Arab Renaissance: A Bilingual Anthology of the Nahda (2018).